The Alaska Pollock has soft white flesh with a mild taste, but it’s very savory and has low fat content. Oceanic and freshly frozen at -40 degrees in only 4 hours after beeing fished, the Alaska Pollock from Minus22 retains all its nutrients, its taste and own texture, for extra freshness. 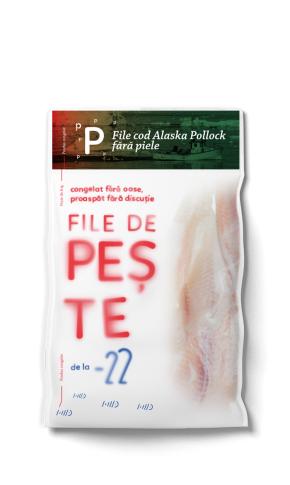 Frozen individually, the Alaska Pollock fillets are transported in controlled cold conditions, with special trucks and boats until the final destination, when reaching its favorite temperature, -22 degrees. The consumption of frozen products reduces the waste of food. Recommendation: the fish should be defrosted in the refrigerator a day before cooking. Don’t use the microwave or water. This way, the fish will keep its structure, flavor and nutrients. For 22 years we make things accessible by bringing the freezing fish to the foothills of Brasov and hence further in the country. The central position and the status as the capital of the cold make us the ideal distributor for freezing fish. All rights reserved. Crafted by Grin.